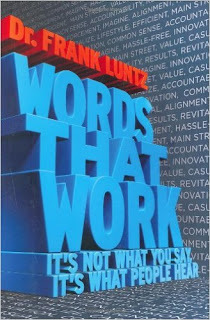 Frank Luntz is the conservative wordsmith behind some of the most successful Republican politicians and movements of the modern era. His book, Words That Work (subtitled: It’s Not What You Say, It’s What People Hear) is an excellent lesson on how to shape language that actually influences people, while avoiding common traps that undermine our efforts at communication. This is in no way a perfect book (as examined here), but a very interesting one, replete with stories and examples. The book’s subtitle alone is one of the most important lessons advocates can learn. Here is a fuller review, if you’d like a fuller exploration of the ideas without (or before) reading the whole book. Our book club read this 1-2 years ago. It had a lot of good tips.